I have to start off by saying that I’m truly blessed. Not once, but now twice, I’ve been able to participate in the BMW European Delivery program and this time, it was really special thanks to the new innovation and technology on display at BMW Welt. I also tried to capture more of the authentic side of Europe this time around. Rather than staying in some of the most luxurious, highly-rated hotel/resorts that side of the pond, I tried to choose some smaller, family-run hotels that brought out Europe’s old world charm. I have to admit there were a few more hiccups on this trip than I would have cared for, but I suppose it’s all part of the adventure of discovering new places on your own. This time, we headed north by northwest, traveling through Munich, Rothenburg ob der Tauber, Eltville-Erbach, Epernay/Reims, Bruges, and ending the trip in Amsterdam. After a fairly uneventful set of flights from Phoenix to Chicago to London Heathrow to Munich, I arrived in Munich around noon (side note- give yourself plenty of time for connections at Heathrow. That place is a zoo, yet great for people watching!) Instead of having a large Mercedes sedan transfer waiting for me, like last time, I decided to hoof it to the train and make use of the extensive public transportation system. It was relatively easy and made getting around the city quite simple. I had booked our first night at the Four Points by Sheraton OlympiaPark. This was a convenience decision, not one of comfort or quality, due to its proximity next door to the Welt. It was a simplistic, moderate quality hotel, but it fit the bill nicely. Unfortunately, my favorite shirt was a casualty of this stay. I apparently left it in the room and when I contacted the hotel to see if it was found, they were unable to locate it. Seems odd that anyone would want a 20 year old shirt I wear to bed, but alas, it is gone forever. I am a little jealous, though: my shirt is living in Europe without me! That first evening in Munich, I enjoyed quite a few pretzels, a Heffeweizen at Hofbrauhaus, and strolling around Marienplatz, a central city square. I really wish I had spent a little more time enjoying the city because it seems to have a lot to offer. I will admit that I basically ruined the first night of my trip with bad jet lag, my addiction to my Blackberry, and the idea that I just had to wear my brand new sneakers without socks, even though I almost never wear sneakers because I live in the desert. So, not only did I visit Hofbrauhaus, but I also visited the local Apotheke. Such an amateur traveler mistake, too! I had the largest blisters I have ever seen and I had them for the entire trip. The next morning, we checked out and walked over to the BMW Welt. We took the elevator up to the check-in area and were warmly greeted by the BMW staff. The new Welt is just an amazing experience from beginning to end. While we waited for our appointment, we enjoyed the complimentary snacks and beverages in the sitting area overlooking the main floor and we also toured the BMW Museum, which is connected to the Welt via a walkway over the road below. Once our appointment began, we were whisked off to begin our presentation of BMW’s technology and, of course, my new car! The vast difference between the presentation I received in 2007 and this one was astounding. From the customized, computerized 3D model of my car to the driving simulation, everything was high tech and cutting edge. I was then taken to a balcony overlooking the main floor, where I could look down at my beautiful car. It was sitting on a rotating platform, which allowed me to see it from all angles. When the “show” was complete, the staff took me down to the floor, snapped some photos, and allowed me to drive around the indoor track for a few laps. You then have the option of valet parking the car to come back inside or take a factory tour or you can begin your journey. We chose to take a factory tour, which was a bit long, but interesting and worth seeing at some point if you are in the area. Following the tour, we hit the road toward our first stop- Rothenburg ob der Tauber! I was finally able to get the car out on the Autobahn and I have to say- the car misses its home dearly. We got stuck in a very long traffic jam due to a horrific accident (Do NOT take driving on the Autobahns lightly! 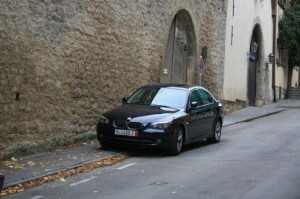 ), but after a few hours, we arrived in tiny Rothenburg safely. Rothenburg is a small, preserved medieval town, so finding your way around on the tight, mostly one-way, cobblestone streets is a bit daunting, especially when driving around a larger model BMW (Let’s just say that parking the car was a little bit easier than leaving and it involved several laughing, pointing tourists, a 30 point turn, and some tears.) We eventually made our way to the Burg Hotel, which is tucked into a back corner along the town’s wall. The hotel is more along the lines of a B&B, though each room appeared to have it’s own bathroom and the breakfast area has separate tables for the guests. The rooms were clean and quaint, most of the stunning views overlooking the town or the surrounding valley. Our room was on the second floor and was decorated in a theme of pink and white. The breakfast buffet was somewhat small and mostly consisted of pastries, breads, meats, and cheeses. The main attraction at breakfast was the stunning view from atop the wall. We only stayed one night in Rothenburg, but we felt that the hotel was located in a good location that was away from the hustle and bustle of the main tourist areas, yet not too far of a walk that it makes the hotel feel out of the way. 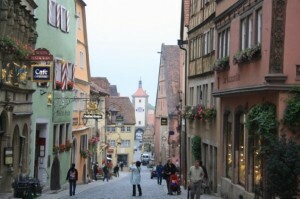 Rothenburg is a tourist trap for two main reasons- its medieval charm and its Christmas shops. Admittedly, we fell for them both. Sometimes, it’s good to do the touristy thing, and schlep along in the crowds, oggling and pointing at things that aren’t like anything you normally see at home. Maybe we didn’t oggle and point, but we did join up with the Nightwatchman’s Tour and walk around town, listening to tales of woe from times past. It wasn’t the most interesting tour, but the guide tried to keep the mood light and the large crowd moving along at a good pace. It was quite chilly out and I certainly am not one for cold weather. The following day, we indulged in Kathe Wohlfahrt, the largest Christmas store in town. One might have thought that the patrons had never seen a Christmas ornament before, but I have to admit- I have never seen that MANY Christmas ornaments before! We ended up buying and shipping a few items back to the States, all of which are stored away for most of the year now. I guess I should also mention the famous Rothenburg Schneeballen. These pastry balls are seen all over the town and are covered with a variety of toppings, such as powdered sugar, chocolate, or caramel. I had gotten an earful about them from a co-worker before my trip, so I knew what to expect. However, many people do not and often take a huge bite into the schneeballen because they look so darn tasty! They are tasty, but bite with caution. After a near panic attack, some heavy cursing, and tears, we made our way out of Rothenburg’s small, mostly one-way streets and headed toward the Rheingau. The drive was somewhat easy and finding the Schloss Kempinski along the banks of the Rhine River, amidst the vineyards, was the easiest part of our trip. 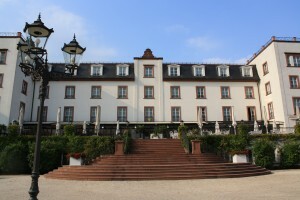 After arriving at the Schloss, located in Eltville-Erbach, we checked into our spacious room overlooking the river. The Schloss is upscale, with a preserved old world charm that perfectly suits what I love about Europe, though it seems to stick out among the other dwellings in the area. It was strange, but it almost seemed too nice for an area that didn’t seem to offer very much in the way of activities. I think we probably didn’t take the time to ask what was around, but I imagine that most of the guests enjoy the local vineyards, including the vineyard and wine tastings right on the property. We did a wine tasting onsite and ended up purchasing some of the house Riesling, which made it back to the US safely in our checked luggage and has a place of honor in our wine rack. We also drove approximately 10 minutes away to visit Kloster Eberbach, a former monastery and current vineyard. The architecture and gardens were impressive, though we did not participate in a wine tasting. Upon our return to the hotel, we also followed the pedestrian tunnel from the Schloss to the banks of the Rhein and enjoyed a brief stroll. In that particular area, the banks are not well maintained and not aesthetically pleasing at all. It was a bit disappointing. That evening, I thought it would be fun to drive into the nearest city, Mainz, for some fondue. I cannot resist a good pot of cheese. I had found a restaurant on the internet and figured the drive would not be too difficult. HA! After some poor map interpretations that led us into Weisbaden and finally making it into Mainz, we come to our destination- a odd looking pub that has absolutely no parking within a mile radius. As I drove around looking for parking, I attempted a 3-point turn on a narrow street and ended up with a gorgeous scratch on the bumper of my beautiful new car. Oh, I was mad! So, we promptly drove back to Eltville-Erbach. The mood of the evening was so tense and thick it had to be cut with a steak knife. At the time, it was maddening, but now we look at that scratch and laugh at the craziness of the evening. If you can believe it, it got even crazier later in the trip, and I have vowed to never drive in a European city or medieval town ever again! After sleeping off my disdain from the previous evening, I was quite hungry, so we ate a large breakfast at the Schloss and then hit the road toward France. We had decided that since we were driving in the area of Verdun, we’d stop along the way to tour the battlefields, which proved to be another unfortunate adventure. As someone who has a strong command of the French language, one would think that I could have gotten us there. However, I maintain that the roads are just poorly marked. After driving in circles through a small, crowded town for what seemed to be an hour, we finally gave up and continued toward Epernay. We finally arrived at La Briqueterie, which is a charming Relais and Chateaux property set just outside of Epernay. The hotel looks like a quaint countryside manor and boasts a highly rated gourmet restaurant, which is one of the main attractions of the hotel. In fact, I think we may have offended the staff by not reserving a table at the restaurant during our stay. I’m sure it’s an exceptional meal, but I would have offended the chef with my extraordinarily picky tastes. Our room was located on the highest floor of the hotel, which is only one floor up from the ground floor, and had a pink floral decor. The room was not exceptionally large, but we enjoyed having a view of the expansive fields across the street and being able to open our window to look out upon them. I admittedly did not take a lot of time to tour the rest of the hotel. Shame on me. We had a lot of things to see and do during our stay in Epernay, so we focused on the activities rather than the accommodations. Our first night in the famed champagne region of France, we drove into Epernay to explore and grab a bite to eat. I immediately began having flashbacks of Mainz. I am just not in to driving on these small European roads! Epernay was a much larger city than I had anticipated, and because of that, I became lost within minutes. With our one small map in hand, we decided our best plan of action was to make our way to the train station. We knew there would be parking there and we could just walk from there to the various champagne houses, including the famed Moet et Chandon. Once we finally got the car parked, we began our stroll around town, only to find that not much was open. Ah-the growing frustration! Most of the champagne houses were closed on our day in town. So, we strolled up and down the main street and eventually grabbed a bite to eat at a local Italian restaurant called Le Sardaigne. The following day, we drove (yes, we attempted it again!) into the nearby city of Reims. Reims is even larger than Epernay, so I was very hesitant to do this, but figured if we could find the train station again, there would be plenty of parking and the car would be safe. We made it to the train station, though it was under construction, and safely parked the car. We then proceeded to walk for what seemed to be miles up and down the streets of Reims for the entire day. We toured Taittinger, attempted to tour Pommery, and visited the stately Notre-Dame Cathedral. We also enjoyed crepes at L’Atelier de Crepes and cheese fondue at Le Chamois. After a long day of walking, we were now faced with a long day in the car. We had decided to take a different way to get to Bruges so that we could stop in tiny Luxembourg, but it added an additional 2 hours on to the drive. No problem, except that I’m a softy for my sweetie and decided to give Verdun one last try since we had to pass by it on our way. This time, we actually found all of the battlefields and forts because we somehow made it to the citadel and the woman working there was able to point us in the right direction. Unfortunately, we could only spare around 2 hours (and really not even that, as we came to find out) to tour Fort Douaumont and the French National Cemetery. We did not even get to see Fort Vaux or the famous “Bayonet Trench”, among other sites. After touring the Verdun area, we headed toward Luxembourg, which wasn’t that long of a drive, but I think I may have spent a half hour or more circling Luxembourg City trying to find a place to park close to the city center and the tourist office. We were on a mission to have our passports stamped! By that time, we were starving, so we also stopped to grab a bite to eat at L’Entracte, which, of course, is a fondue restaurant! After our meal, we hit the road again and headed toward Bruges, only to be stuck in terrible traffic. Who knew that Beligum was the Los Angeles of Europe? We finally made it to Bruges around 11:30pm, but it took another half hour trying to find the hotel, which was tucked into a small corner along the canal, just past the fish market. During daylight hours, it would have been simple to find, but since I was tired, frustrated, and beyond agitated, I literally stopped the car in the middle of the road and refused to continue on. Since that is not reasonable, I did continue on and we finally reached the hotel around midnight. The Duc de Bourgogne hotel is a small, family-owned hotel situated at the center of Bruges, right on the water, with the most spectacular view in town. The hotel only has 10 rooms and has a feel more along the lines of a bed and breakfast, though the rooms have private bathrooms. Our room was on the second floor and was simple, clean, and a wonderful view of the canal and the swans swimming below. We enjoyed breakfast in the hotel’s only restaurant each morning, but did not have dinner there. Instead, we chose to enjoy local favorites in town- french fries, waffles, and grilled cheese! Oh, and the chocolate and beer! Who could forget about that? We bought several boxes of chocolate from Dumon, a small chocolate shop just off Market Square. Delicious! If anyone wants to send me some, I like the dark chocolates with vanilla creme in the middle! We also paired our chocolate with fine Belgian beer. Though we tasted many, we took the time to do a full brewery tour at De Halve Maan. The tour is one of the more extensive brewery tours I have been on, since it is quite lengthy and incorporates a lot of history into the walk. By the time the tour was over, I felt that I had earned my beer. 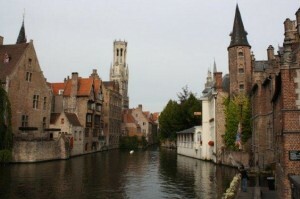 We did quite a bit of walking during our stay in Bruges, but the town warrants it since it’s absolutely stunning. After our short two night stay in Bruges, we headed off to our final stop in Amsterdam. We took the opportunity to drop off our car at the BMW drop off center just outside of town, which was incredibly smart. Traffic in Amsterdam was intense. There were cars, bicycles, and people everywhere! We had a cab drop us off at the Hotel Toren, which is located along the Keizersgracht canal and within a short walking distance to the Jordaan district and the Anne Frank House. The Hotel Toren is quite eclectic, with deep colors and posh furnishings. It’s in a very quiet neighborhood, which is something I sought out, but I felt it was within a good walking distance to everything or at least had good access to public transit. The staff at Hotel Toren was great and we absolutely loved the bar. Nothing like a super cold Heineken and some good conversation! Our room was at the front of a building just a bit of a ways down from the main reception building and had a nice view of the canal. It was a fairly decent sized room and had a very fancy coffee maker. It’s funny what you remember from each hotel! We definitely took advantage of our time in Amsterdam and saw as much as we could and stuffed our faces with as much food as would could. We enjoyed an evening canal tour, walked through the Van Gogh Musuem, visited the Rijksmuseum, toured the Anne Frank House, attempted to tour Heineken, and glanced into a coffee shop. We did NOT sample any of the local “coffee”! We ate pancakes and indulged in fondue twice (see my fondue page for details.) We also strolled along the canals until our feet were numb. The scenery was just so breathtaking that it would have been a shame if we hadn’t walked around forever. I also had the opportunity to return to the amazing city of Amsterdam TWICE- once in 2017 and once in 2018. While I stayed with a good friend, I got to experience the city like a local. We enjoyed a canal tour with a special selection of beverages on board, visited the Royal Palace (gorgeous! ), and ate our way through some of Amsterdam’s best restaurants. We enjoyed pizza at La Perla, steak and frites at Morgan and Mees, sweet and savory crepes at Bretonne Cocotte, and fine Italian at Toscanini. The trip all over Northwestern Europe was quite extensive, and quite chilly, but an interesting one at that. I laughed, I cried, I cursed, and I stared in awe. I walked down the aisle of a cathedral where a king was coronated and I walked the streets of towns that were once part of the Holy Roman Empire. As angry as I may have been at scratching my car in Mainz, or at not being able to find the hotel in Bruges, you can’t argue with being one with history. Please feel free to e-mail me for information on this trip!